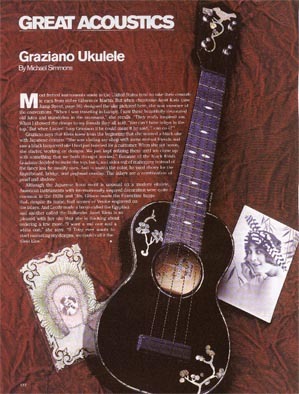 decorated old lutes and mandolins in the museums," she recalls. "They really inspired me. bridge, and peghead overlay. The inlays are a combination of pearl and abalone. with her uke that she is thinking about ordering a few more. "I want a red one and a white one,"
she says. "If Tony ever wants to start marketing my designs, we could call it the Klein Line."